Students at West MS participated in the Every Kid Votes online activity. It’s not just adults lining up at Disciple Central Community Church who are voting early. Tuesday, more than 700,00 children led the way in the largest student mock presidential election in history. In partnership with Studies Weekly’s Every Kid Votes project, DeSoto West Middle School students went to the ‘polls’ and ‘voted’ for the next President of the United States. Every Kid Votes! has integrated learning objectives that align with social studies, English Language Arts standards, and critical thinking. For the past few weeks, West Middle School students have studied the electoral college process, voting, government and civic responsibilities. 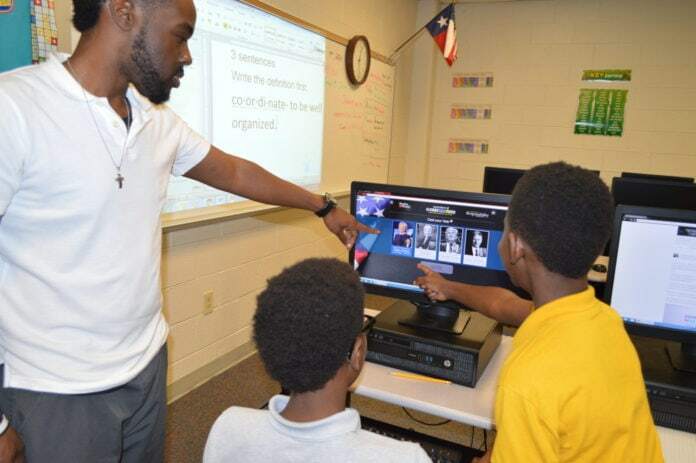 Instructors utilized online lesson plans, videos, games, quizzes, related media and more. On November 1, they joined students across the country in casting votes for the president. 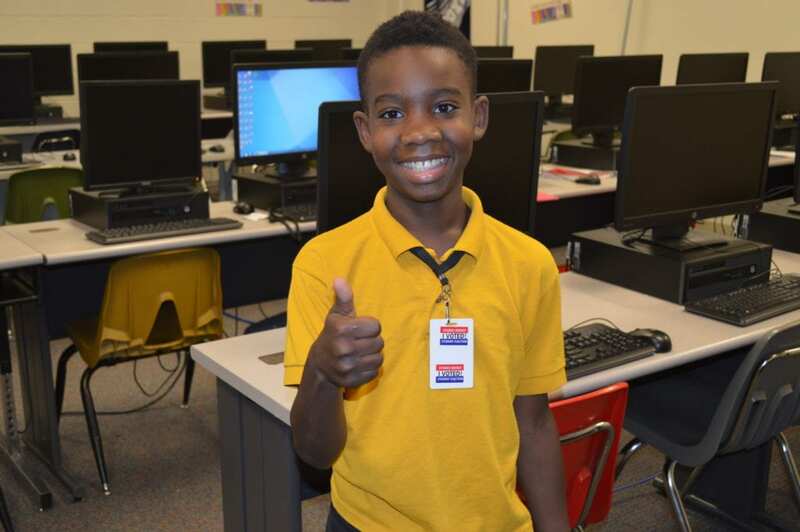 West Middle School student receives ‘I Voted’ sticker after casting online ballot. Students registered their vote for one of the four presidential candidates using the online system from Every Kid Votes! When finished, the students received an I Voted! sticker that they wore the remainder of the day. 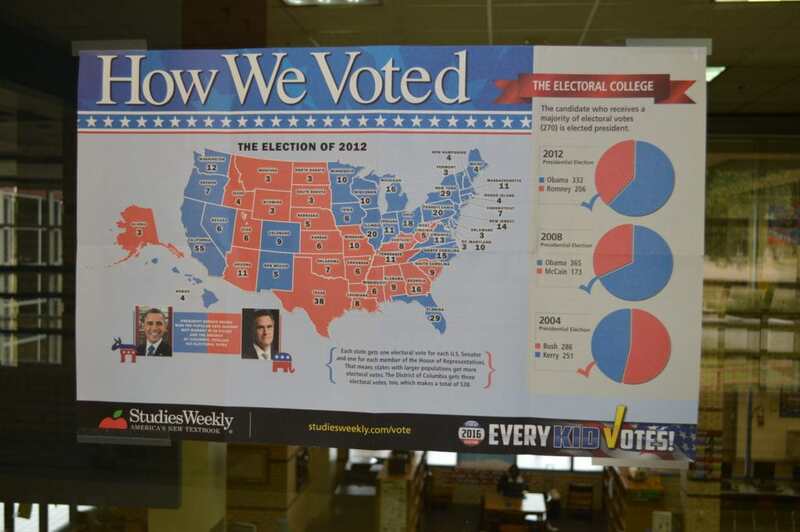 Classroom diagram explains electoral college results of 2012. Nationwide voting ends on November 4, 2016. So far in the Mock 2016 U.S. Presidential Elections students chose Former Secretary of State Hillary Rodham Clinton as Commander-In-Chief. Clinton received 367 Electoral Votes to Donald Trumps’ 165 votes. Candidates need 270 electoral votes to win. The popular vote was a little closer. By press time 350,298 (48.4%) of students voted for Clinton and 265,854 (36.7%) put their faith in Trump. Libertarian Party Candidate Gary Johnson and Green Party Candidate Jill Stein both got about 53,60(7.4%) respectively. According to the Every Kid Votes! website, students have accurately selected the president for the last three elections!